During a visit to Aitutaki, we found the lagoon irresistible for boating. The resort we were at had numerous plastic canoes, paddle boards and wind surfers. I borrowed the plastic two-person canoe, paddled for a few metres with wife as extra power and we both gave up after a few strokes of the paddle. Then we spotted a rather rough-looking plywood canoe with an outrigger. It was brilliant. We sat up straight and it was quick when paddled. It was great for looking at the coral reefs because calm was created between the outrigger and the hull. We went on to cruise the lagoon, visiting lagoon-side restaurants, had a great time and were both sold on what is known as a “waka ama” or canoe with outrigger. Having a holiday retreat at Karitane just north of Dunedin, we considered his to be the perfect craft for the tidal estuary. (But with not as many restaurants to visit). The shallow draft of the waka was a great combination for the numerous sand bars of the estuary. 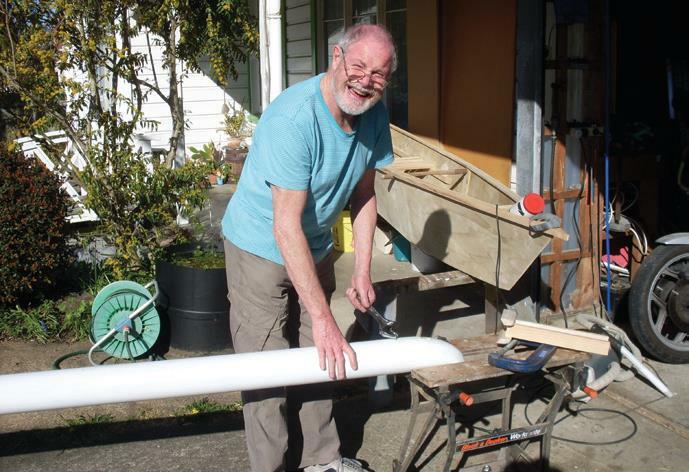 To build it, I concentrated on the advice of most waka ama advocates: that the canoe should be made of locally available materials, quick to assemble on the launching area and very cheap to make. This waka cost me less than $200 by using recycled material and left-over house paint for the finish. I did not work from plans but used a cardboard model that I made as a guide. The waka takes less than two minutes to assemble after we take it off its trolley. My waka is made from two sheets of 7 mm-thick construction ply and almost one litre of polyurethane waterproof glue (see Panel, Glue). The timber was old house-framing timber that was going to be firewood. I had this idea of a box with a point at each end with seats to add strength. The basic box is 300 mm wide and 400 mm high. The middle part is 2400 mm long and then the ends are put on. So I have a five metre-long boat from two sheets of 7 mm-thick construction ply that cost $64. To start, I built the middle part of the hull. The hull (waka) is from straight-cut strips of ply—400 mm-deep for the sides and a 300 mm-wide piece for the hull bottom, leaving a 400 mm-wide space from one side of the canoe to the other across the top between the coamings (or gunwale and inwale). The ply sides are joined to the hull bottom with shaped stringers running the length of the hull. I glued and screwed the stringers into place, later removing the screws and filling the holes. I chose the stringers because of the cost of glue and fibreglass and wanted a classic appearance. But these seams could be stitched and taped. A temporary frame is screwed in place at each end (a piece of customwood approximately 20 mm-thick, 400 mm-wide at the top, sloping down 400 mm at the sides to 300 mm-wide at the bottom). This serves to hold the “box” to the correct shape while seats, spreaders and each end are fitted. No need for building moulds—the boat was being made on saw horses. The craft is identical each end and can be paddled in either direction. I used left-over 10 mm-wide strips as joiner doublers at the ends, glued and held in place by temporary screwing while the glue dried. Tek screws are great because the built-in washer under the head holds the two bits of ply together very well. I removed and reused these after the glue dried. I put long cleats about 150 mm below the top of the hull to support the 50 mm x 15 mm wooden seat slats. Each seat slat was shaped differently and fitted individually. The seats are part of the hull strength and I screwed and glued them into place. When the glue had dried, I removed the screws and replaced them with dowels. There are almost no metal parts on this boat other than the stainless hooks on the ama (or outrigger) for assembly and towing eyes. Doubler for joining is clamped while glue dries. Seat slats are glued and screwed, then dowelled, to long cleats. Temporary customwood frame is screwed in place at each end. The next sheet of ply has two 400 mm-wide strips 2400 mm long cut from its length. Here is the cunning part of the hull that forms the style of the waka — each 400 mm-wide strip is cut in half at the 1200 mm mark with a 45-degree cut. This cut defines the bow shape. If the cut is slightly concave, the bow, when fastened together, will have a clipper bow shape. If the cut is slightly convex, you will have a rounded bow shape. I prefer the classic sloping bow so made the cut at 45 degrees in a straight line. These bow pieces are glued onto the doublers at the end with the long side at the top, then screwed in place and the glue allowed to dry. Then I pulled the bow strips together and cable-tied or wired the bow and glued it. If you decide on a clipper bow, that may require a bit more force to form the shape. While the bottom of the hull in the middle has been fixed, the bottom at the bow and stern needs to be installed. I placed the middle hull with the empty bow shapes onto a piece of ply and marked the inside bow shape on the ply with a pencil. This is cut out and glued onto the doubler and held in place with temporary Tek screws to be removed when the glue dries. It is then cable-tied or wired and glued onto the sides. The same is done at the other end and so the hull shape is defined. I installed two 520 mm-long broom handles that protruded about 60 mm out each side of the hull at the joins. These protruding sections became the hooks for the car-tube rubber bands binding the outrigger beams or spars to the hull. The temporary frames could now be removed. Basic box shape. Note shaped stringers in join between side and hull bottom. Canoe was constructed on saw horses. The hull is finished by cutting strips of wood about 12 mm x 12 mm which are glued around the top of the hull inside and out to form a coaming. I have heaps of G-clamps so I used these, but they could be screwed in place inside then outside the hull. I used short pieces of wood that are easier to handle. Because there is a lot of lamination going on, joins are not a problem and make the job easier. The coaming rounds off a harsh shape on the hull with a good look. My favourite tool when boatbuilding is a small disc grinder with a medium-soft flexible disc. I use this to shape the coaming; it’s a super-quick method of making your woodwork look professional. I put 20 mm x 5 mm plastic, rubbing strakes down each side on the chine to the bow and stern joins. Another strake was fastened to the bow and stern sections down the middle to the join. Note there are no bulkheads in the hull. This permits the bilge water to flow easily from one end to the other. A couple of rocking movements back and forward and the craft will be bailed out. The boat remains stable when swamped because it is a multihull. Make sure when finishing off with handles or other small, spreader-like attachments for handling the boat that you allow space in the bottom of the hull for storing and transporting the ama and outriggers. Strips of wood glued make the coaming. 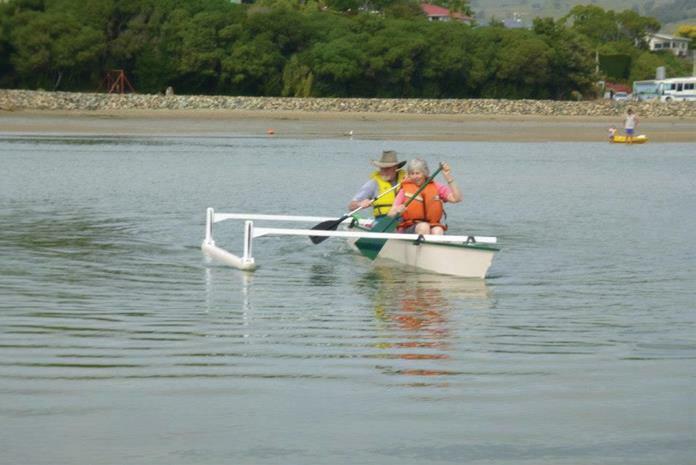 Short spreader is near front to allow room for paddles and outrigger to slip into the canoe for carrying. The beams or spars to the ama (outrigger float) are 50 mm x 50 mm knot-free timber about 2.5 metres long. I cut a clear 100 x 50 mm piece in half with the skill saw. The ama was a second-hand 100 mm-diameter plastic sewer pipe, 2.4 metres long, from a building site. I did saturate it with bleach before using it as a waka float. Each end was blocked with a wood plug and shaped for looks. 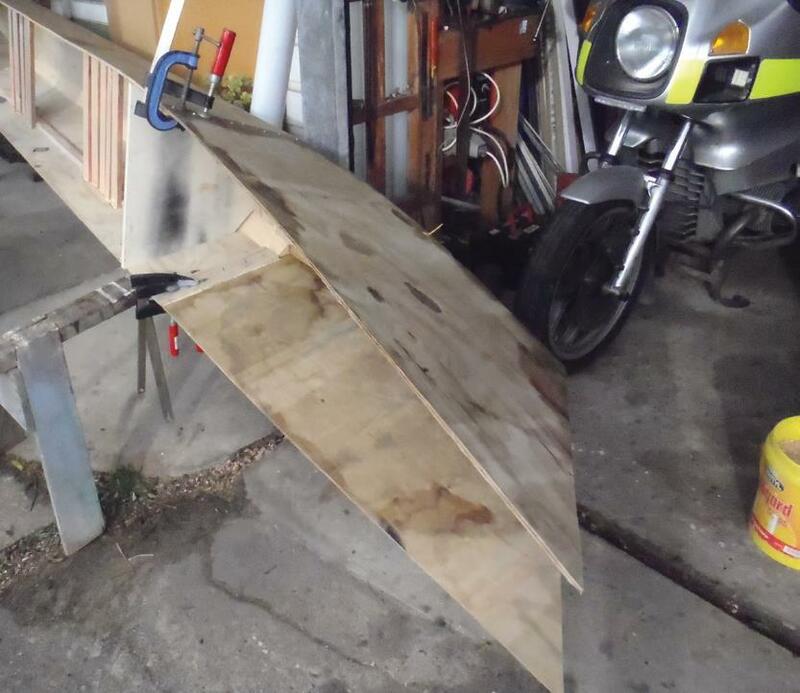 The wooden attachment to be strapped to the ama I fabricated and glued to the outrigger beams. I turned the plugs on my lathe but the pipe could be cut and plastic-welded or wood-carved with a chainsaw, then the pieces glued into the plastic pipe. I put drain plugs at each end in case of leaks. The beams or spars to the ama (outrigger float) are 50 mm x 50 mm knot-free timber. Plastic rubbing strakes placed down each side on the chine and down the middle to the join. I purchased about 1.5 metres of 6 mm-diameter stainless rod. To enable me to bend the stainless rod close to its end, I made a tool out of a bit of scrap mild steel. Mine was a piece of 12 mm square section 150 mm long with a 6 mm hole in one end and across at the other end. The eyes for towing or mooring at the bow or stern are pieces of the stainless rod bent in a U shape, cut to length and hammered into holes drilled into the stem. I used the steel-bending tool to curve by about 12 mm the ends of the stainless rod sticking out in the interior of the canoe. Then I relieved a notch in the inside of the stem and hammered the folded rod ends flush into this notch. Filler covers the hammer marks and secures the eyes. This provides a super-cheap, strong good-looking eye and a smooth interior. Hooks are made for the ama to attach the rigging to. The four 6 mm holes for each hook are drilled through from one side of the ama to the other and are spaced on either side of where each outrigger will sit. 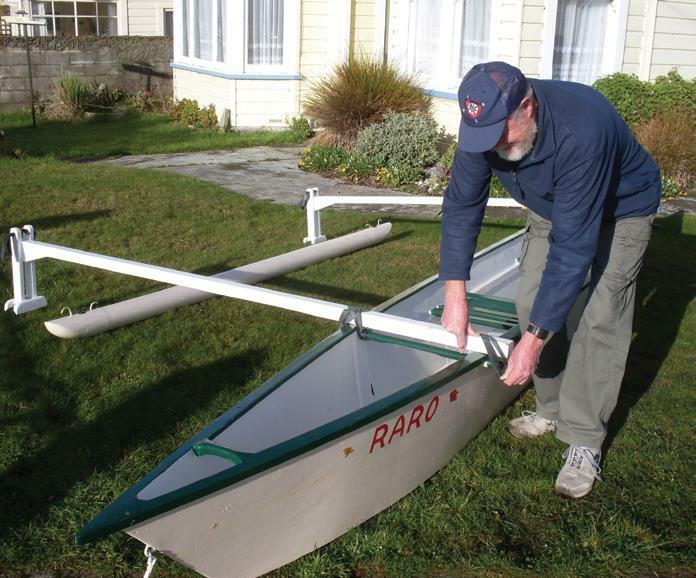 The distance between the rigging attachments at either end of the ama is the same as the distance between the broom handles on the hull so the outrigger spars, when secured to the hull and ama, are parallel to each other. A small loop is put on one end of each of the four stainless rods that are about 250 mm long. After drilling long holes first, I drove the rods into the ama, with the small loop preventing them being pulled right through. I drilled a second hole for each loop which I then hammered into place. My thought was that I preferred a smooth surface under the ama; but if it did protrude it would not matter, as it could act as a wear loop when the ama was handled on concrete. The protruding rod has a hook bent about 100 mm above the ama for the rubber bands to attach to. A car-tyre tube was cut into rubber bands about 40 mm wide. Twelve are required but I carry spares. None have broken yet but they are key to the stability of the boat so I would not like to be without them. The bands are looped together in pairs. I held them in place inside the hull at the end of the broom handles by cable tie. When the outrigger beam is put in place, I simply loop one loop at a time diagonally over the outrigger and back to the handle on the outside. This is done on four ends. Set up and ready to launch. There is ply left over to make paddles. The person at the rear is the captain and has the larger paddle. Make it an interesting shape about the size of a dinner tray. The handle is about 1500 mm long. The paddle end of the broom stick is cut at steep angle and screwed and glued into place. If you want to, put a small T on the other end so you can use it to steer and paddle. The other paddle can be a little smaller and shorter as it is mainly used for the forward motion paddle. It should be a large dinner-plate size with a handle about 1200 mm long. This also has the handle cut at a steep angle and glued to the paddle with a T-handle at the other end. Have fun in your “waka ama.” Paint it fun colours. Keep the load under 200 kilos. Always wear a life jacket. You will be the envy of everyone one watching you. At The Shed magazine, we had a question about glue used in this waka ama. Stuart replied that he used Selleys Aquadhere Durabond. However, the manufacturer’s guideline says, while this glue is 100 percent waterproof, it is “not suitable for below waterline applications or continuous submersion. For this we recommend Knead-It Aqua, a versatile, hand-kneadable, fast-setting co-extruded epoxy repair system especially suitable for application to damp, wet or underwater substrates.” Stuart explains that for his build, “I did test the Aquadhere Durabond before I put the boat together because it seemed too good to be true. It is a very good glue as long as the joints are not tight. It requires a small gap to perform its duty. You put glue on one surface and wipe a moist cloth on the other surface. The surfaces are put together and clamped. In about 10 minutes the glue foams and fills the gaps and then a couple of hours later it hardens. I find it a surprisingly good product.